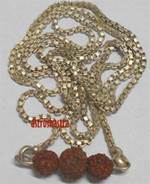 An effective Rudraksha beads in red colour thread and for those suffering from high Blood pressure and Diabetes. The Mala has one Two faced in centre developing harmonious relationships. The moon is the ruling influence and hence it can greatly help in controlling negative traits like anger, frustration and lack of concentration. Two three mukhi controlling malefic effects of Mars like disease of blood, blood pressure, weakness, disturbed menstrual cycle, kidney etc.. Depression, negative and guilty feelings, inferiority complexes can be lessened by wearing this mukhi. Jupiter is one of the most important planet in horoscope , which controls pancreas , which causes diabetes. 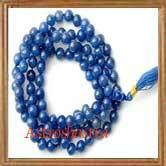 Wearing five mukhi mala is one of the effective remedy for controlling Diabetes and Hypertension. One who wears these five faced obtains all kind of riches and prosperity. Persons suffering from high blood pressure get relief by wearing these but one should select them very carefully, or better they take the help of experts. It helps in diseases pertaining to lungs, heart and blood.